Fallujah that provides access to northern Baghdad. ISIS also lost control of Sinjar city and several towns northeast of Tel Afar along its northern frontier in Iraq. These losses, while substantial, have not compromised ISIS’s urban priorities of Mosul and Raqqa. Two notable losses did complicate ISIS’s defenses in the environs Mosul and Raqqa. ISIS lost the battle for Kobane, northwest of Raqqa, in December 2014, and the Syrian Kurdish YPG subsequently pushed ISIS presence back to the perimeter of Raqqa district, re-capturing two strategic bridges along the upper Euphrates (see area on map northwest of Raqqa). In response ISIS consolidated its defenses between Raqqa city and these new Kurdish positions. In Iraq, Kurdish Peshmerga attacks at Gwer and anti-ISIS Sunni tribal activity near Qayarra and Sharqat in early 2015 perforated a critical ISIS stronghold in southern Ninewa. Losses in this area compromise ISIS’s ability to defend Mosul from the south. ISIS reacted to the Peshmerga and Sunni tribal attacks by declaring new governorates in the Jazeera and the Zaab in February 2015, suggesting a greater defensive mobilization around Mosul. ISIS is expanding visibly on two fronts: in Hasaka province in northeastern Syria (see area on map northeast of Raqqa) and in the Damascus, Qalamoun, and Bekaa valley region in southwestern Syria (see area on map north of Damascus). 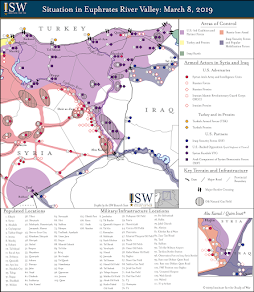 ISIS lost territory to YPG forces near Tel Hamis and Hasaka city in February 2014, and subsequently increased attacks against the YPG along the road between Tel Tamr and Ras al-Ayn. Beginning in December 2014, ISIS also increased its activity along the Syrian-Lebanese border, establishing a Shari’a court east of Arsal and clashing with the Lebanese Armed Forces in the vicinity of Ras Baalbek. This activity sparked rumors that ISIS intends to establish a “wilayat” within Lebanon in the near term. In addition, past ISIS-linked attacks in Beirut and Tripoli indicate that ISIS may project force into these areas in the future. ISIS also intensified its activities in the environs of Damascus city in early 2015, reasserting its latent historical presence in the southern suburb of Hajar al-Aswad and seizing several positions from opposition forces in the sparselypopulated areas southeast of the capital. ISIS currently enjoys popular support in some areas of Jordan, Gaza and the West Bank, as demonstrated pro-ISIS demonstrations and arrests of ISIS supporters in the past several months. However, these pockets do not provide a high level of material support to ISIS, and thus are not marked as support zones. ISIS attacked Iraq-Jordan and Iraq-Saudi Arabia border crossings several times in January and February 2015, however, a reminder that ISIS is engaging neighboring states with more than violent rhetoric. 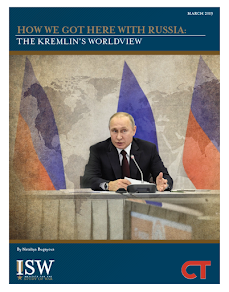 ISIS’s current mission, as articulated in the October 2014 issue of its English-language Dabiq magazine, is to both “Remain and Expand.” ISIS will persist in its expansion attempts even as its strategic defenses are tested in Iraq and Syria. 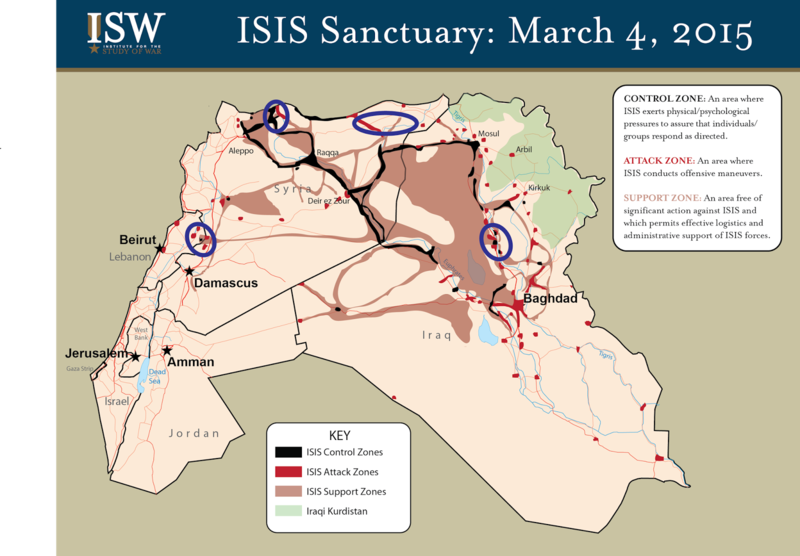 ISW will continue to update this ISIS sanctuary map to account for ISIS’s losses and gains.